Just because your bathroom is petite, doesn't mean it has to be inefficient or unattractive. Award-winning designer Leslie Lamarre shares her pro tips for getting the most out of any bath. 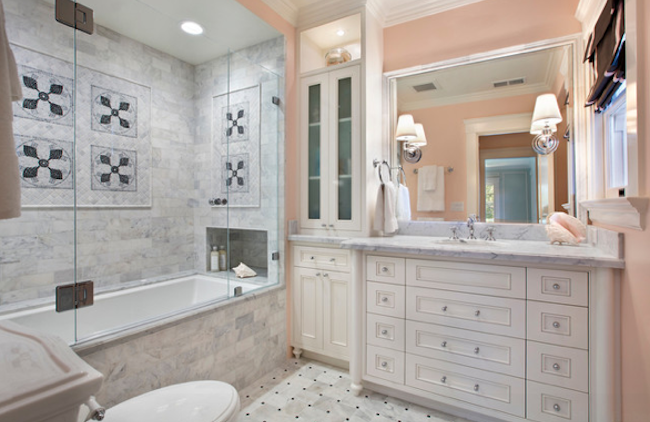 When it comes to bathroom remodeling, small can be beautiful. With smart planning, a petite bath can be attractive, efficient, and luxurious. And here’s another beauty point: Working within your current bathroom’s footprint rather than bumping out a wall or adding on will help keep your budget under control, even if you opt for luxe materials—a real plus in these financially uncertain times. A creative approach to picking out fixtures is key to making the most of a tight space. The size and shape of the room, your willingness to move plumbing connections, and personal style preferences are among the factors that will influence your fixture choices. 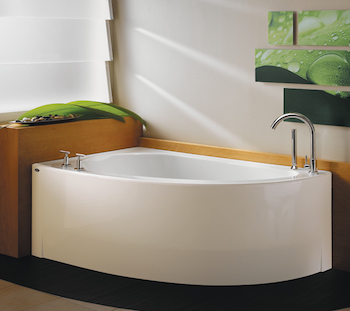 Neptune WIND 60" Customizable Corner Bathtub. If the average five-foot-long rectangular tub doesn’t appeal—or won’t fit—some readily available options are 48-inch tubs (including some extra-deep, claw-footed Victorian-style models), corner tubs, and square or oval Japanese soaking tubs. Or consider getting rid of the tub entirely. “It’s actually more comfortable to take a shower if you’re not standing in the tub,” Lamarre says, “and a frameless glass shower makes the space look bigger.” A clear glass shower enclosure visually expands the space more than etched or frosted finishes will. Using the same wall and floor covering throughout the whole bathroom, including the shower area, lends an open, spa-like ambience. Older homeowners or those with mobility issues will find it convenient to enter a shower without climbing over the side of a tub. But think twice about eliminating the tub if you don’t have one in another bathroom; if you decide to sell later on, a totally tub-free house may be a turnoff to some buyers. Whether you want—or have room for—a vanity will influence bathroom sink choices. Lamarre says a vanity has to be at least 24 inches wide to accommodate a full-size sink and provide some functional counter space. But the hidden storage even a petite vanity offers is still a plus if you can make do with a smaller sink and don’t need much counter. If you’re pro vanity, a vessel or above-surface sink maximizes below-counter storage—a flush or undermount unit can take up as much as a third of the vanity’s internal area. And a vessel sink “doesn’t need a deck around it,” according to Lamarre, yielding more usable counter space. The standard depth for a vanity is 21 inches, but you can go shallower if you choose a semi-recessed sink installation. These sinks are designed to be positioned about halfway into the vanity, and protrude several inches beyond the counter’s front edge. Besides being space-savers, they look great. 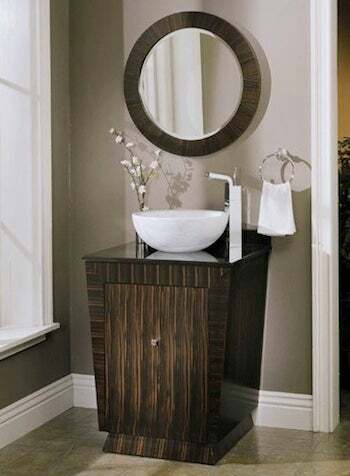 If you don’t have room for a vanity, or just don’t want one, check out a pedestal or wall-mounted sink. These styles have a lighter, less solid look than a vanity, and may be ideal for truly tiny spaces. “There are some really cool options; some wall-mounted sinks are only 11 inches deep,” Lamarre says. Some have broad, integrated ledges or shelf-like surfaces at the side; some come with built-in towel bars. There are lots of ways to incorporate storage into the open space below pedestal and wall-mounted sinks: open shelves, prefab or custom cubbies, even decorative baskets and bins. Don’t overlook the storage potential above the toilet—there’s plenty of wall space for open shelves or shallow cabinets. And there are lots of over-toilet storage units available at big-box stores and storage specialty shops. Once you’ve picked your major fixtures, focus on the smaller but still important details, such as the medicine cabinet. You can stash more items in a deep cabinet, but one that’s flush with the wall might be a better pick. A protruding cabinet “will make the space feel smaller,” Lamarre says. Depending on the room and your cabinet choice, it may be possible to install two identical cabinets side by side. Besides doubling the storage, the expanse of mirrors can make the room look larger. Last but far from least: lighting. A light, bright space is always more attractive and inviting, and in the bathroom in particular, light improves functionality. Recessed ceiling lights are a good starting place, but be sure to provide task lighting—Lamarre recommends sconces—around the mirror. 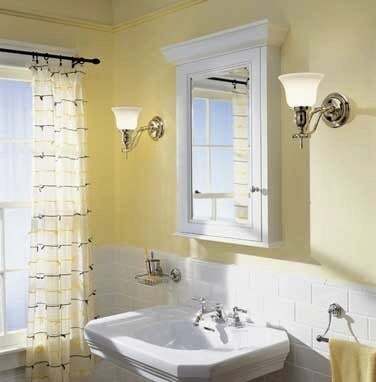 If you like to shave in the shower, good-quality lighting will make the job easier and safer. She also recommends installing motion-activated accent lighting in the toe-kick area. It provides a gentle glow and can increase safety when someone enters the room in the middle of the night. With careful shopping and planning, it’s possible to have the bath of your dreams in a compact space—without breaking the bank.